John Kendal, president of the Credit River Anglers Association of Toronto, Canada, prepares to release an Atlantic salmon into the Salmon River near Altmar, New York. PULASKI, N.Y. — Back in the early years of the 19th century, Lake Ontario had the greatest population of landlocked Atlantic salmon in the world. So many ran the tributaries each fall to spawn, men could drive horse-drawn wagons into the streams and spear or net a load full. Housewives would wade in up to their knees and catch salmon dinners in their aprons. Although they were capable of overcoming incredible natural obstacles like waterfalls and raging, shallow rapids, they were no match for human progress. A combination of dams, overfishing and water pollution completely wiped them out of the tiniest Great Lake by the 20th century. As our nation grew, her waters got dirtier and late in the 1960s the Chicago, Detroit and Buffalo Rivers caught fire. Seeing the writing on the wall, Americans demanded anti-pollution measures that forced municipalities and heavy industry to clean up their acts, setting the country on course to a healthier environment. It worked as the country’s rivers and lakes began looking and feeling like water again. Healthy, balanced fish populations rebounded rapidly, but the Great Lakes, the world’s greatest reservoirs of fresh water, presented a new problem: exploding populations of baitfish. When alewives and smelt grow quickly, predators take longer to control the population. Each spring, windrows of winter-killed baitfish, 18 inches deep by up to 10 feet wide, ringed Lake Ontario in a smelly crust. As a result the New York State Department of Environmental Conservation responded by stocking voracious chinook and coho salmon, rapidly growing species indigenous to the Pacific Ocean. They tore into the schools of bait and the NYSDEC decided to restore Atlantic salmon into the system and commenced stocking massive numbers in 1983. They even set aside Little Sandy Creek in Oswego County as an Atlantic salmon nursery, and banned fishing on the stream in autumn to protect the spawners. This was unsuccessful, however, because the salmon’s main food source — alewives and smelt — contain Thiaminaise, an enzyme that destroys vitamin B1, an essential nutrient salmon need to reproduce. Without B1, salmon fry are unable to survive, and the program was dropped in 1987. Traditionalists kept the pressure on, and their efforts bore fruit in 1996, and the state has been maintaining a token presence by annually stocking 30,000 into the Salmon River and 20,000 into Oak Orchard River. Long regarded as one of the premier fly-fishing destinations in the world, the Salmon River has two stretches on the upper river, comprising nearly one mile, designated as catch-and-release fly fishing areas open April 1 through Nov. 30. Parking is on county Route 22 above the Salmon River Fish Hatchery, and the lower fly fishing section starts at the county Route 52 bridge in the village of Altmar and is open Sept. 15 through May 15. Some juvenile Atlantic salmon have been caught in survey nets that are too small to have been stocked. What is causing the natural reproduction is uncertain, but some point to the round goby, which is native to the Black Sea and is rich in thiamine. Although salmon prefer deep waters and gobies prefer shallow, inshore waters, their paths cross for a short time in spring and fall when the lake’s water temperatures are consistent throughout. Apparently, Atlantic salmon prey on enough gobies during these short spells to enrich themselves with thiamine to keep them fertile. Atlantics can tolerate warmer water than any other salmon, allowing them to enter the Salmon River in summer where they stay until the kings start appearing in late August. Still, these fish are relatively rare and their runs are cyclical. Targeting Atlantics is worth the effort, hitting streamers and even dry flies. With natural spawning it is possible to catch naturally bred Atlantic salmon, which can be easily identified because wild fish have all their fins. Periods of high water after a rain or the power company’s recreational white-water releases are the best time to fish the river. Quantities of landlocked Atlantic salmon are limited, but are truly a trophy. 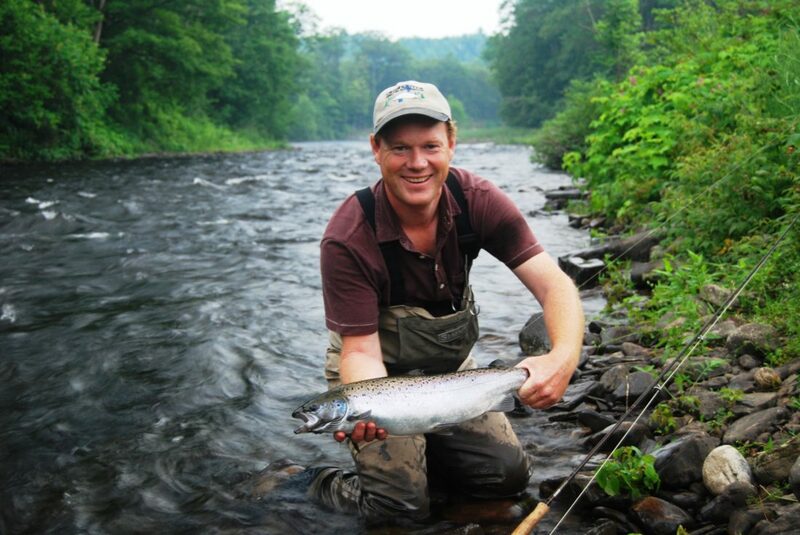 For Oswego County fishing information, accommodations and visitor information, access the website at www.visitoswegocounty.com, or call 1-800-248-4386.